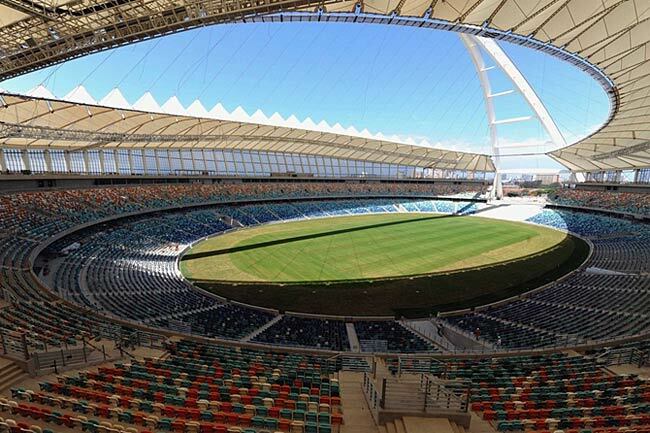 gmp is the German architectural firm that was appointed as the lead architect for three of South Africa's new 2010 stadia - Cape Town Stadium, Nelson Mandela Bay Stadium (Port Elizabeth) and Moses Mabhida Stadium in Durban. That's quite a feat, and partner-in-charge Hubert Nienhoff talks about the designs, the challenges and the experience. CapeInfo: Winning the competition for three stadiums in one go is a major feat. Which stadiums in gmp's track record stand out as being the reason for being chosen as the architect. 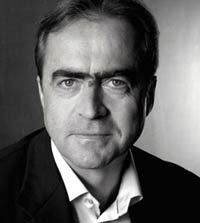 Hubert Nienhoff: The stadiums for the 2006 World Cup in Germany (Berlin, Frankfurt and Cologne) have certainly certified gmp's capacity to design world class stadium facilities. The particular designs in the different competitions and the convincing presentations where far more reason for our appointments than the track record. gmp always tried to find the quintessence of the place in spatial and social meaning and then design particularly for this conditions. Our clients found exactly what they imagined in our designs. Aside fromt the architectural external features, is there a simple recipe and formula for a successful, FIFA-approved stadium? The success starts with the understanding of the functionalities and logical requirements of the game and the World Cup as one of its forms. The design is, in the first place, a translation of functional requirements into a design and not so much an artistic approach. The combination of the perfect functionality with the genius loci of every particular project is the secret of our success. Apart from external details, what are the main differences between the Cape Town and Durban stadiums? The philosophies of the two designs are as completely different as the location and people in Durban and Cape Town are. Durban wanted a new icon in their skyline, a multipurpose stadium suitable for Olympic Games, a huge gesture towards the city. Cape Town wanted a small, light and elegant stadium that does not shout for attention and integrates itself into the urban fabric and subordinates itself to the dramatic landscape that surrounds the city. The perfect functionality and viewing capacity (so you feel part of the event) of the stadiums had to meet the very different external requirements. The development of the stadium designs had to go completely different ways. Externally, Durban seems to take the opportunity for creating an architectural feature in a city which has few features, while Cape Town's stadium makes more of an attempt at "architectural good neighbours". What were the different challenges in the three cities and how do you think you responded to them? It comes back to the question what is the right thing to do for the particular environment. The stadium in Durban is outside the city centre. It continues the height of the city skyline with the arch which is like an exclamation mark at the end of the skyline. It completes the sentence in a way. The connection to the city is implemented through the split of the arch with the huge window towards the city. A long park guides the people from downtown to the stadium and the stadium receives the visitors with open arms. The building becomes part of the urban fabric and extends the city, creates new opportunities between the city and the stadium. The task in Cape Town is completely different. Cape Town is dominated by its world unique mountain setting and the location for the stadium is virtually in the middle of the City. The urban fabric around Green Point is dominated by small scale houses and not large scale structures as in Durban. Green Point Common as an urban park was underutilised and we saw the opportunity to restructure the entire park and embed an elegant object that reacts very carefully to the diverse landscape, like a subtle Perlemoen (abalone) placed in the arrangement. Respect of what is there was the main force in the design process. The building mustn't be pop. It has to have an elegant, curved outline that doesn't compete with the datum line of Table Mountain and integrates into the numerous lines of the city hills. It must be an object that can only be read in its surrounding and hides its true scale to adapt to the urban fabric. It has to work and accept the world unique light spectacle that happens in Cape Town every day. Port Elizabeth's cityscape lacks identity mainly due to the fact of large viaducts and railways separating the city from the sea. The scale of Port Elizabeth can not be compared to that of Durban or Cape Town. The urban fabric is very diverse with a lot of breaks in the structure. The stadium is situated in the middle of this diverse fabric between industrial areas and residential neighbourhoods. It sits on top of a small hill next to a small lake with viewing possibility to the ocean. The stadium is a new, calm reference point for the town and enhances the possibility of orientation in the area dramatically through its exposed position. The outer colonnade has the same appearance into all directions, is open to the outside and welcomes the people to come into the new place of assembly. People from all directions (and kinds) are welcome in an equal way. The brick floor, like a red carpet leads the people into the stands and does not make a difference between inside and outside. The colonnade has an appropriate size compared to the buildings in its vicinity. The roof has the form of sheltering leaves and emphasises the hub function of the stadium. On the other hand it is shelter for the notorious winds in Port Elizabeth and creates a calm outdoor plaza for the people. The interior design is as compact as possible to give a very dense atmosphere and the feeling to be protected from the environment. There was probably a greater emphasis on sustainability after 2010 for the SA stadiums compared to those you have built before. How did you respond to this requirement? The “White Elephant” was a huge issue in all projects and we had intense discussions with the clients on the sustainability of all three projects. The approaches to the problem differed in all cases as the cultures in the cities differ as well. They have in common that all stadiums are multipurpose stadiums with the pitch designed with special emphasis on rugby, because this is still the national sport in South Africa. Multi-purpose means: suitable for a large number of events beside the sport like fairs, shows, concerts, religious or political celebrations etc. Open-air facilities with the capacity of a stadium where missing in all of the towns. The new stadiums are suitable for truck access to the pitch, have large storage capacities, large video screens and sound systems as well as state of the art catering facilities, media facilities and mass spectator safety. The packages in the cities are then flavoured differently with an athletic track in Durban, to make the stadium suitable for an Olympic Games, a cable car to the top of the arch and commercial areas in the basement of the stadium. Port Elizabeth has extensive outdoor areas around the lake and a large number of private suites in combination with generous foyers and conference rooms that are suitable for a large amount of conventions as well as smaller business meetings. 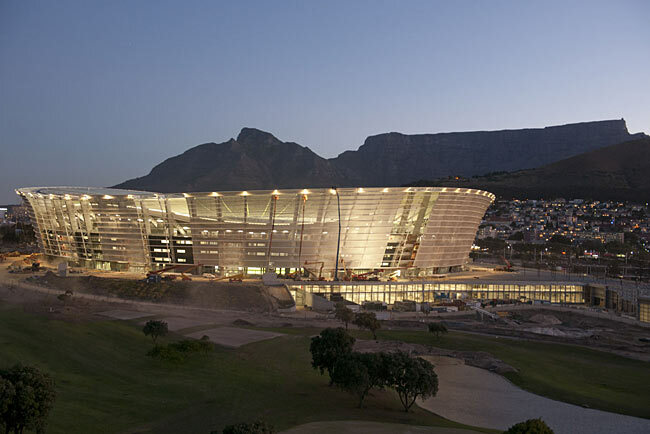 Cape Town's new stadium is prepared to bring a large number of events into the city centre. The Cape Minstrel Carnival traditionally ends in the Green Point Stadium and a direct access to the field was provided. The famous Cape Argus Cycle Tour could have a new finish destination with the stadium with the possibility to incorporate an exhibition on the large main concourse. Large banqueting facilities, conferencing areas, in house parking for 1,200 cars and more than 3,500m2 of office space complete the package. The podium can host a sport fitness centre or institute after the World Cup and the Plaza in front of the West Stand will certainly be one of the best outdoor spots for celebrations between Table Mountain as a backdrop and the Atlantic Ocean in front, facing the fantastic Cape Town sunset. Apart from the shortage of time in Cape Town, what were the biggest architectural challenges you faced? The biggest architectural challenge in Cape Town was to integrate a huge building of nearly 300m diameter and 50m height into a diverse urban fabric. Today, even for us, it is surprising how compact the stadium has become. We tried very hard to make the stadium as small as possible while we had to deal with the given capacity of 68,000 spectators. Compared with other stadiums with the same capacity, the spatial impression is very compact. All other architectural decisions had to be subordinated under the urban integration. The roof construction keeps the stadium profile low. The texture of the façade is purely horizontal to let the building appear smaller. The raking columns and the curvature of the roof contribute to the dynamic of the building also they create technical challenges. Were there any highlights on the three projects? The construction of such immense roofs is always a highlight. The closure of the arch in Durban, the completion of the compression ring in Cape Town and the first view of the entire bowl. The big lift of the cable net in Cape Town was exciting and spectacular at the same time. The integration of the last girder in Port Elizabeth and the ability to feel the bowl atmosphere for the first time. A walk on the arch of the Durban stadium or on top of the glass of the Cape Town roof are experiences of a very special nature as well and intensify the relationship between the creator and the object on a very intense level. In those special moments, the expectations of one's own planning are suddenly overtaken by the reality. gmp has extensive international experience, what was it like working in SA? While the step onto the African continent was new for gmp, SA has the big advantage of being an English-speaking country. Communication, and with it language, is essential to architecture and compared to projects in countries like China, in the Arabic World or in countries with Latin-based languages, the start in SA was very easy and understanding and agreement on procedures and ideas was not a problem. The planning culture in SA is largely influenced by the British planning system which is different to the German system, but it is very familiar to gmp and we have lots of experience in it. In general, we experienced the working atmosphere as very friendly and sometimes far more polite than in Germany. Also when you are having serious discussions, it must be fun to work together and the South African humour fitted very well with our mentality and we had lots of fun. German efficiency combined with South African lifestyle was certainly a winning combination for the World Cup Stadia.